In this VetGirl v-blog, we demonstrate how to measure a blood pressure in a cat using the doppler. 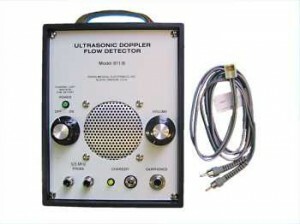 The doppler technique uses a crystal to detect flow instead of a stethoscope. Using this technique, ultrasound gel is placed on the crystal surface. The gel and crystal are then placed distal to the cuff over the artery. The crystal converts the pulsatile flow signal to an audible sound delivered via the doppler speaker. A pressure cuff is used to occlude the artery, with the assistance of a sphygmomanometer. The pressure cuff is inflated to a pressure greater than that of the blood pressure, at which time the audible sound of the pulsitile flow is lost. The pressure in the cuff is then slowly released. The pressure at which the audiblble flow signal returns is considered the systolic blood pressure. VetGirl's favorite? The Parks Doppler machine. We believe it's a must have for any veterinary clinic! 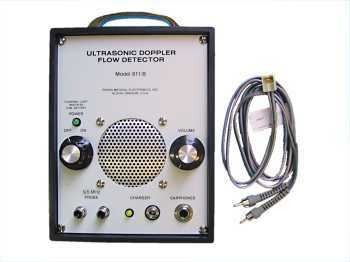 Where can you find a crystal doppler for veterinary use anymore? I work at a veterinary clinic in New Mexico and we have been searching for one as sometimes we get “over pressure” reading on our machine. May I ask what reference that says cats ‘ BP with Doppler is closer to the mean.